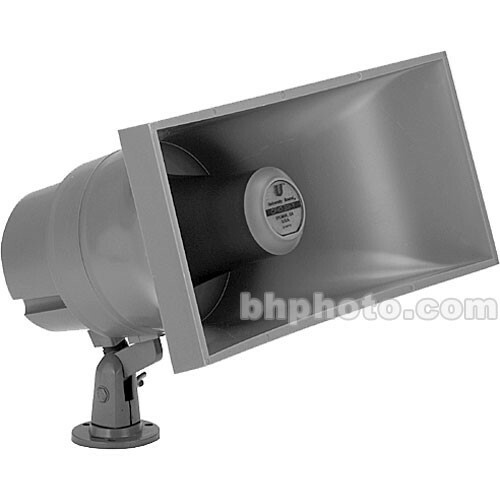 The Electro-Voice CFID32T is a 32-watt paging horn with a 1.5" voice-coil, and a 25V/70.7V matching line transformer, designed for paging installations requiring reliable speech intelligibility under adverse ambient conditions. The CFID32T casing is finished in a weather-resistant gray, and offers a diffraction effect for a wide horizontal dispersion. The unit is equipped with an integral swivel bracket, and a weather-sealed gland-nut connection. Box Dimensions (LxWxH) 14.6 x 12.9 x 10.6"